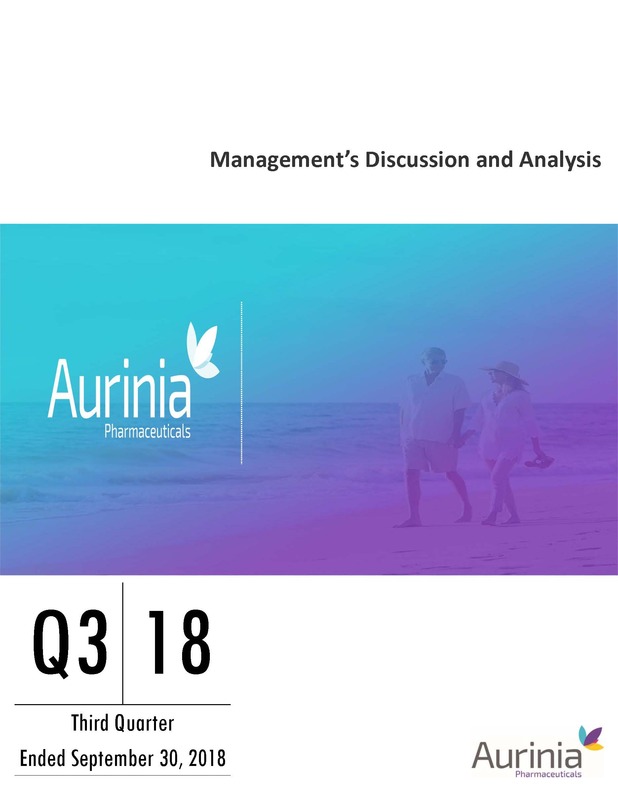 The following Management’s Discussion and Analysis of Financial Condition and Results of Operations (“MD&A”) provides information on the activities of Aurinia Pharmaceuticals Inc. and its subsidiaries on a consolidated basis and should be read in conjunction with our unaudited interim condensed consolidated financial statements and accompanying notes for the third quarter ended September 30, 2018 and our annual MD&A and audited financial statements for the year ended December 31, 2017. In this MD&A, unless the context otherwise requires, references to “we”, “us”, “our” or similar terms, as well as references to “Aurinia” or the “Company”, refer to Aurinia Pharmaceuticals Inc., together with our subsidiaries. All amounts are expressed in United States (U.S.) dollars unless otherwise stated. Dollar amounts in tabular columns are expressed in thousands of U.S. dollars. This document is current in all material respects as of November 6, 2018. The financial information contained in this MD&A and in our unaudited interim condensed consolidated financial statements has been prepared in accordance with International Financial Reporting Standards ("IFRS") as issued by the International Accounting Standards Board ("IASB") applicable to the preparation of interim financial statements including International Accounting Standards 34: Interim Financial Reporting. The unaudited interim condensed consolidated financial statements and MD&A have been reviewed and approved by our Audit Committee on November 6, 2018. This MD&A has been prepared with reference to National Instrument 51-102 “Continuous Disclosure Obligations” of the Canadian Securities Administrators. Under the U.S./Canada Multijurisdictional Disclosure System, we are permitted to prepare this MD&A in accordance with the disclosure requirements of Canada, which are different from those in the United States. A statement is forward-looking when it uses what we know and expect today to make a statement about the future. Forward-looking statements may include words such as “anticipate”, “believe”, “intend”, “expect”, “goal”, “may”, “outlook”, “plan”, “seek”, “project”, “should”, “strive”, “target”, “could”, “continue”, “potential” and “estimated”, or the negative of such terms or comparable terminology. You should not place undue reliance on the forward-looking statements, particularly those concerning anticipated events relating to the development, clinical trials, regulatory approval, and marketing of our product and the timing or magnitude of those events, as they are inherently risky and uncertain. Securities laws encourage companies to disclose forward-looking information so that investors can get a better understanding of our future prospects and make informed investment decisions. our plan to conduct a study with pediatric patients. the assumptions relating to the capital required to fund operations through AURORA clinical trial results and regulatory submission. actual results could be materially different from what we expect if known or unknown risks affect our business, or if our estimates or assumptions turn out to be inaccurate. As a result, we cannot guarantee that any forward-looking statement will materialize and, accordingly, you are cautioned not to place undue reliance on these forward-looking statements. forward-looking statements do not take into account the effect that transactions or non-recurring or other special items announced or occurring after the statements are made may have on our business. For example, they do not include the effect of mergers, acquisitions, other business combinations or transactions, dispositions, sales of assets, asset write-downs or other charges announced or occurring after the forward-looking statements are made. The financial impact of such transactions and non-recurring and other special items can be complex and necessarily depend on the facts particular to each of them. Accordingly, the expected impact cannot be meaningfully described in the abstract or presented in the same manner as known risks affecting our business. The factors discussed below and other considerations discussed in the "Risk Factors" section of this MD&A could cause our actual results to differ significantly from those contained in any forward-looking statements. difficulties we may experience in identifying and successfully securing appropriate vendors to support the development and commercialization of our product. Although we believe that the expectations reflected in the forward-looking statements are reasonable, we cannot guarantee future results, levels of activity, performance or achievements. These forward-looking statements are made as of the date hereof and we disclaim any intention and have no obligation or responsibility, except as require by law, to update or revise any forward-looking statements, whether as a result of new information, future events or otherwise. For additional information on risks and uncertainties in respect of the Company and our business, please see the "Risks and Uncertainties" section of this MD&A. Although we believe that the expectations reflected in such forward-looking statements and information are reasonable, undue reliance should not be placed on forward-looking statements or information because we can give no assurance that such expectations will prove to be correct. Additional information related to Aurinia, including our most recent Annual Information Form ("AIF"), is available by accessing the Canadian Securities Administrators’ System for Electronic Document Analysis and Retrieval ("SEDAR") website at www.sedar.com, the U.S. Securities and Exchange Commission’s ("SEC") Electronic Document Gathering and Retrieval System ("EDGAR") website at www.sec.gov/edgar. or our website at www.auriniapharma.com. Aurinia is a clinical stage biopharmaceutical company focused on developing and commercializing therapies to treat targeted patient populations that are suffering from serious diseases with a high unmet medical need. We are currently developing voclosporin, an investigational drug, for the treatment of Lupus Nephritis ("LN"), focal segmental glomerulosclerosis ("FSGS"), and Dry Eye Syndrome ("DES"). Our head office is located at #1203-4464 Markham Street, Victoria, British Columbia V8Z 7X8. Aurinia has its registered office located at #201, 17904-105 Avenue, Edmonton, Alberta T5S 2H5 where the finance function is performed. Aurinia Pharmaceuticals Inc. is organized under the Business Corporations Act (Alberta). Our common shares are currently listed and traded on the NASDAQ Global Market ("NASDAQ") under the symbol "AUPH" and on the Toronto Stock Exchange ("TSX") under the symbol "AUP". We have two wholly-owned subsidiaries: Aurinia Pharma U.S., Inc., (Delaware incorporated) and Aurinia Pharma Limited (United Kingdom incorporated). We are currently developing voclosporin, an investigational drug, for the potential treatment of LN, FSGS and DES. Voclosporin is a next generation calcineurin inhibitor ("CNI") which has clinical data in over 2,400 patients across multiple indications. It has also been previously studied in kidney rejection following transplantation, psoriasis and in various forms of uveitis (an ophthalmic disease). The topical formulation of voclosporin, VOS (voclosporin ophthalmic solution), is an aqueous, preservative free nanomicellar solution containing 0.2% voclosporin intended for use in the treatment of DES. Studies have been completed in rabbit and dog models and a single Phase 1 study has also been completed in healthy volunteers and patients with DES. VOS has IP protection until 2031. Legacy CNIs have demonstrated efficacy for a number of conditions, including transplant, DES and other autoimmune diseases; however, side effects exist which can limit their long-term use and tolerability. Some clinical complications of legacy CNIs include hypertension, hyperlipidemia, diabetes, and both acute and chronic nephrotoxicity. of a single amino acid of the cyclosporine molecule. This modification may result in a more predictable pharmacokinetic and pharmacodynamic relationship, an increase in potency, an altered metabolic profile, and easier dosing without the need for therapeutic drug monitoring. Clinical doses of voclosporin studied to date range from 13 - 70 mg administered twice a day ("BID"). The mechanism of action of voclosporin has been validated with certain first generation CNIs for the prevention of rejection in patients undergoing solid organ transplants and in several autoimmune indications, including dermatitis, keratoconjunctivitis sicca, psoriasis, rheumatoid arthritis, and for LN in Japan. We believe that voclosporin possesses pharmacologic properties with the potential to demonstrate best-in-class differentiation with first-in-class regulatory approval status for the treatment of LN outside of Japan. limited incidence of glucose intolerance and diabetes at therapeutic doses compared to tacrolimus. Our target launch date for voclosporin as a treatment for LN is early 2021. Lupus Nephritis ("LN") is an inflammation of the kidney caused by systemic lupus erythematosus ("SLE") and represents a serious manifestation of SLE. SLE is a chronic, complex and often disabling disorder. SLE is highly heterogeneous, affecting a wide range of organs and tissue systems. Unlike SLE, LN has straightforward disease measures (readily assessable and easily identified by specialty treaters) where an early response correlates with long-term outcomes, measured by proteinuria. In patients with LN, renal damage results in proteinuria and/or hematuria and a decrease in renal function as evidenced by reduced estimated glomerular filtration rate ("eGFR"), and increased serum creatinine levels. eGFR is assessed through the Chronic Kidney Disease Epidemiology Collaboration equation. Rapid control and reduction of proteinuria in LN patients measured at six months shows a reduction in the need for dialysis at 10 years (Chen et al., Clin J. Am Soc Neph., 2008). LN can be debilitating and costly and if poorly controlled, can lead to permanent and irreversible tissue damage within the kidney. Recent literature suggests severe LN progresses to end-stage renal disease ("ESRD"), within 15 years of diagnosis in 10%-30% of patients, thus making LN a serious and potentially life-threatening condition. SLE patients with renal damage have a 14-fold increased risk of premature death, while SLE patients with ESRD have a greater than 60-fold increased risk of premature death. Mean annual cost for patients (both direct and indirect) with SLE (with no nephritis) have been estimated to exceed $20,000 per patient, while the mean annual cost for patients (both direct and indirect) with LN who progress to intermittent ESRD have been estimated to exceed $60,000 per patient (Carls et al., JOEM., Volume 51, No. 1, January 2009). Focal segmental glomerulosclerosis ("FSGS") is a rare disease that attacks the kidney’s filtering units (glomeruli) causing serious scarring which leads to permanent kidney damage and even renal failure. FSGS is one of the leading causes of Nephrotic Syndrome ("NS") and is identified by biopsy and proteinuria. NS is a collection of signs and symptoms that indicate kidney damage, including: large amounts of protein in urine; low levels of albumin and higher than normal fat and cholesterol levels in the blood, and edema. Similar to LN, early clinical response which can be measured by reduction of proteinuria in addition to maintaining podocyte structural and functional integrity, is thought to be critical to long-term kidney health in patients with FSGS. FSGS is likely the most common primary glomerulopathy leading to ESRD. The incidence of FSGS and ESRD due to FSGS are increasing as time goes on. Precise estimates of incidence and prevalence are difficult to determine. According to NephCure Kidney International, more than 5,400 patients are diagnosed with FSGS every year; however, this is considered an underestimate because a limited number of biopsies are performed. The number of FSGS cases are rising more than any other cause of NS and the incidence of FSGS is increasing through disease awareness and improved diagnosis. FSGS occurs more frequently in adults than in children and is most prevalent in adults 45 years or older. FSGS is most common in people of African American and Asian descent. It has been shown that the control of proteinuria is important for long-term dialysis-free survival of these patients. Currently, there are no approved therapies for FSGS in the United States or the European Union. Dry eye syndrome ("DES"), or dry eye disease ("DED") or keratoconjuctivitis sicca, is characterized by irritation and inflammation that occurs when the eye’s tear film is compromised by reduced tear production, imbalanced tear composition, or excessive tear evaporation. The impact of DES ranges from subtle, yet constant eye irritation to significant inflammation and scarring of the eye’s surface. Discomfort and pain resulting from DES can reduce quality of life and cause difficulty reading, driving, using computers and performing daily activities. DES is a chronic disease. There are currently two FDA approved therapies for the treatment of dry eye; however, there is opportunity for potential improvement in the effectiveness by enhancing tolerability and onset of action and alleviating the need for repetitive dosing. The disease is estimated to affect greater than 20 million people in the United States (Market Scope, 2010 Comprehensive Report on The Global Dry Eye Products Market). Our business strategy is to optimize the clinical and commercial value of voclosporin and become a global biopharma company with a focused renal autoimmune franchise. Conducting a Phase II tolerability study of VOS, after which we will look at all options to create value with our proprietary nanomicellar ocular formulation of voclosporin in the human health field including, but not limited to, further development, out-licensing or divestiture while remaining focused on our nephrology efforts. We achieved a significant milestone on September 25, 2018 with the completion of enrollment for our AURORA Phase III clinical trial. The target enrollment of 324 patients was surpassed due to high patient demand with 358 LN patients randomized in sites across 27 countries. AURORA is a 56-week trial (52-week primary endpoint and a four-week follow-up period). Therefore, we expect to have top-line data for this trial in late 2019. We believe the totality of data from both the AURORA and AURA clinical trials can potentially serve as the basis for a New Drug Application ("NDA") submission with the FDA following a successful completion of the AURORA clinical trial. Under voclosporin’s fast-track designation we intend to utilize a rolling NDA process which will allow us to begin the submission process following a positive pre-NDA meeting with the FDA, which we anticipate will occur in the first quarter of 2020. To that end we are actively preparing the non-clinical and Chemistry, Manufacturing and Controls (“CMC”) modules required for the NDA submission. Our current plan is to complete the NDA submission, including the clinical module, in the second quarter of 2020 and therefore we do not expect any delay in our originally planned regulatory timelines. The AURORA clinical trial is a global double-blind, placebo-controlled study, (designed with target enrollment of 324 patients) to evaluate whether voclosporin added to background therapy of CellCept®/mycophenolate mofetil can increase overall renal response rates in the presence of low dose steroids. no administration of rescue medications. Patients completing the AURORA trial have the option to roll over into a 104-week blinded extension study (AURORA 2). During the second quarter ended June 30, 2018, the first patients commenced rolling over into AURORA 2. Enrollment in this study continues to increase as additional patients complete AURORA. The data from AURORA 2 will allow us to assess the long-term benefit/risk of voclosporin in LN patients, however, this study is not a requirement for potential regulatory approval for voclosporin. Data from AURORA 2 assessing long-term outcomes in LN patients should be valuable in a post-marketing setting and for future interactions with various regulatory authorities. In order to enhance and complete the clinical dossier, we plan to conduct a confirmatory drug-drug interaction study ("DDI study") between voclosporin and MMF. Legacy CNIs, such as cyclosporin A, impact MMF concentrations, and our goal with this short study is to confirm the insignificant impact of voclosporin upon MMF concentrations that were previously seen in a renal transplant study. In order to achieve a more meaningful DDI study, we will conduct the study with SLE patients rather than with healthy volunteers as originally proposed. We are currently in the process of initiating sites and enrolling patients for the DDI study. In this study, patients will be monitored for a period of two weeks. We believe the results of this study will add to our knowledge of voclosporin in a multi-targeted therapeutic approach and should have no impact on our submission time-line or the potential approval of voclosporin. We also plan to evaluate voclosporin in pediatric patients after a potential FDA approval of an indication for adults with LN. We have strategically developed a plan to expand our voclosporin renal franchise to include FSGS. Additionally, we are also evaluating our proprietary nanomicellar VOS for the treatment of DES. The advancement of these new indications, in addition to LN, represents an expansion of our strategy, pipeline and commercial opportunities. Similar to LN, integrity of the podocyte is a key feature of disease progression in FSGS. The disease has straightforward disease outcomes where an early clinical response correlates with long-term outcomes, measured by proteinuria. Based on our clinical data in LN which demonstrated that voclosporin decreased proteinuria, we believe voclosporin has the potential to benefit patients with FSGS. Our clinical data in LN demonstrated that voclosporin decreased proteinuria. Furthermore, voclosporin appears to demonstrate a more predictable pharmacology and an improved lipid and metabolic profile over legacy calcineurin inhibitors, which have shown efficacy in treating autoimmune disorders similar to those we are targeting. We submitted our IND to the FDA in the first quarter of 2018. We received agreement from the FDA with regards to the guidance we provided on this study and the IND is now active. Our Phase II proof-of-concept study in FSGS which is an open-label study of approximately 20 treatment-naive patients was initiated in June 2018. As we are essentially enrolling newly diagnosed patients and this is a rare disease, we believe enrollment could take up to twelve months from the current date, however, we plan to have interim data readouts throughout the course of the trial in 2019. As we have been focused on LN, expanding our scope to include other proteinuric renal diseases is synergistic with our current strategy and long term vision. We initiated a Phase II head-to-head tolerability study of voclosporin ophthalmic solution (“VOS”) versus Restasis® (cyclosporine ophthalmic emulsion) 0.05% for the treatment of Dry Eye Syndrome (“DES”) in July of 2018, and full enrollment is anticipated imminently. This four-week study of approximately 90 patients is expected to complete by the end of 2018 with data available before the end of January 2019. Upon productive meetings with FDA, we re-activated our existing IND and are aligned to proceed. We believe CNIs are a mainstay of treatment for DES. The goal of this program is to develop a best-in-class treatment option. The topical formulation, VOS, has shown evidence of efficacy in our partnered canine studies and in a small human Phase I study (n=35), supporting its development for the treatment of DES. Animal safety toxicology studies were previously completed in rabbit and dog models, and additional animal safety toxicology studies are being planned. Completed preclinical and human Phase Ib studies using our nanomicellar VOS formulation have shown encouraging results in terms of delivery of active drug to the target tissues of the eye. The nanomicellar formulation enables high concentrations of voclosporin to be incorporated into a preservative-free solution for local delivery to the ocular surface. This has been shown to potentially improve efficacy, dosing frequency and tolerability versus the current treatments for DES. We therefore believe VOS has a differentiated product profile with long patent life that has the potential to compete in the multi-billion-dollar human prescription dry eye market. We announced on November 8, 2018 that Richard M. Glickman, Aurinia's Chairman and Chief Executive Officer, intends to retire from his position once a suitable replacement is identified and appointed. The Board of Directors will retain a search firm and will initiate a search for his successor. Under his direction, the Company has delivered on its key milestones and evolved into a patient-centric, late-stage clinical company with investigational drugs addressing multiple indications across the global immunology market. Dr. Glickman believes it is the optimal time to bring in a new Chief Executive Officer who can build on our clinical success as we approach commercialization. His commitment to the Company and the patients it serves is steadfast, and he plans to remain a resource to the Board and management team as we enter the next chapter. For the three months ended September 30, 2018, we reported a consolidated net loss of $18.34 million ($0.21 loss per share) as compared to a consolidated net loss of $13.12 million ($0.16 loss per share) for the three months ended September 30, 2017. The increase in the consolidated net loss for the three months ended September 30, 2018 was primarily due to an increase of $4.80 million in non-cash derivative warrant liabilities, resulting from the quarterly fair value adjustment, compared to a decrease of $355,000 for the third quarter of 2017. On a year-to-date basis, we recorded a consolidated net loss of $49.53 million ($0.59 per share) for the nine months ended September 30, 2018, compared to a consolidated net loss of $67.46 million ($0.91 per share) for the nine months ended September 30, 2017. The lower consolidated net loss for the nine months ended September 30, 2018 was due primarily to recording a smaller non-cash increase in estimated fair value of derivative warrant liabilities on revaluation of derivative warrant liabilities ($9.36 million for the nine months ended September 30, 2018 as compared to $32.93 million for the nine months ended September 30, 2017). reflected the increase in our share price from $4.53 at December 31, 2017 to $6.64 at September 30, 2018 whereas the comparable figure from 2017 reflected a change in our share price from $2.10 at December 31, 2016 to $6.27 at September 30, 2017. After adjusting for the non-cash impact of the revaluation of the derivative warrant liabilities, the net losses before the changes in estimated fair value of derivative warrant liabilities for the three and nine month periods ended September 30, 2018 were $13.55 million and $40.17 million respectively compared to $13.47 million and $34.53 million for the same periods in 2017. The increase in the net loss before changes in estimated fair value of derivative warrant liabilities primarily reflected an increase in research and development expenses related to the commencement of AURORA 2 and our FSGS and DES studies. Net research and development ("R&D") expenditures increased to $11.15 million and $30.54 million respectively for the three and nine month periods ended September 30, 2018 compared to $10.81 million and $25.24 million respectively for the three and nine month periods ended September 30, 2017. The increase in R&D expenses for the three and nine month periods ended September 30, 2018 reflected costs associated with the planning and startup phases for the AURORA 2 study and the FSGS and DES Phase II trials. Direct AURORA trial costs were $6.36 million and $18.00 million for the three and nine month periods ended September 30, 2018 compared to $6.03 million and $16.89 million respectively for the three month and nine month periods ended September 30, 2017. Clinical Research Organization ("CRO") and other third party clinical trial expenses were $7.87 million and $20.30 million respectively for the three and nine month periods ended September 30, 2018 compared to $5.18 million and $15.78 million respectively for the three and nine month periods ended September 30, 2017. The increased costs primarily reflected higher CRO costs, including service fees and pass-through costs related to the AURORA trial, the AURORA 2 study and the commencement costs for the Phase II FSGS and DES clinical studies. Salaries, annual incentive pay accruals and employee benefits (excluding non-cash stock compensation expense noted below) increased to $1.02 million and $3.15 million respectively for the three and nine month periods ended September 30, 2018 compared to $719,000 and $1.96 million respectively for the three and nine month periods ended September 30, 2017. The increase reflected the hiring of fifteen additional R&D employees since January 1, 2017, annual salary increases, and a higher incentive pay accrual resulting from the additional personnel numbers. We recorded a non-cash stock compensation expense of $619,000 and $2.17 million respectively for the three and nine month periods ended September 30, 2018 compared to $273,000 and $692,000 for the three and nine month periods ended September 30, 2017 for stock options granted to R&D personnel. We incurred drug supply costs, primarily for drug packaging, stability and distribution, of $1.30 million and $3.75 million respectively for the three and nine month periods ended September 30, 2018 compared to $4.40 million and $6.06 million respectively for the three and nine month periods ended September 30, 2017. These costs were primarily for encapsulating, packaging and distribution of the drug supply for the AURORA trial and manufacturing drug supply for VOS, whereas the drug costs for 2017 included an expense of $3.17 million to manufacture drug product ("API"). Other expenses, which included items such as travel, clinical trial insurance, patent annuity and legal fees, phone and publications increased to $346,000 and $1.17 million respectively for the three and nine month periods ended September 30, 2018 compared to $238,000 and $751,000 respectively for the three and nine month periods ended September 30, 2017. The increase reflected higher expenses, particularly for travel, related to the AURORA program. Corporate, administration and business development expenses were $2.92 million and $10.18 million respectively for the three and nine month periods ended September 30, 2018 compared to $2.65 million and $8.98 million respectively for the three and nine month periods ended September 30, 2017. Corporate, administration and business development expenses included non-cash stock option expense of $887,000 and $3.48 million respectively for the three and nine month periods ended September 30, 2018 compared to $795,000 and $2.59 million respectively for the three and nine month periods ended September 30, 2017. Salaries, director fees, payroll accruals and employee benefits (excluding stock compensation expense noted above) were $1.08 million and $3.41 million respectively for the three and nine month periods ended September 30, 2018 compared to $803,000 and $2.98 million respectively for the three and nine month periods ended September 30, 2017. The increases reflected payroll costs in 2018 for six additional employees hired since January 1, 2017, higher incentive pay accruals recorded in 2018, annual salary increases for employees and higher director fees. Professional and consulting fees were $404,000 and $1.38 million respectively for the three and nine month periods ended September 30, 2018 compared to $409,000 and $1.53 million respectively for the three and nine month periods ended September 30, 2017. Rent, insurance, information technology, communications and other public company operating costs were $399,000 and $1.31 million respectively for the three and nine month periods ended September 30, 2018 compared to $315,000 and $974,000 respectively for the three and nine month periods ended September 30, 2017. The increases reflected overall higher activity levels, higher staff numbers, and higher director and officer insurance costs commensurate with conducting a Phase III clinical trial. Travel, tradeshows and sponsorships expense decreased to $157,000 and $602,000 respectively for the three and nine month periods ended September 30, 2018 compared to $328,000 and $902,000 respectively for the three and nine month periods ended September 30, 2017. For stock option plan information, stock option grants and outstanding stock option details refer to note 6 of the unaudited interim condensed consolidated financial statements for the three and nine months ended September 30, 2018. We granted Nil and 2.98 million stock options for the three and nine month periods ended September 30, 2018 respectively at weighted average exercise prices of $Nil and $5.28(CA$6.53) per common share respectively compared to 340,000 and 2.69 million stock options at weighted average exercise prices of $6.23(CA$8.01) and $4.11(CA$5.42) respectively for the same periods in 2017. For the nine month period ended September 30, 2018 the granted stock options were allocated 1.66 million to corporate, administration and business development personnel, and 1.32 million to R&D personnel compared to 1.99 million to corporate, administration and business development personnel, and 701,000 to R&D personnel for the same periods in 2017. Application of the fair value method resulted in charges to stock-based compensation expense of $1.51 million and $5.65 million respectively for the three and nine month periods ended September 30, 2018 (2017 - $1.07 million and $ 3.29 million) with corresponding credits to contributed surplus. For the three and nine month periods ended September 30, 2018, stock-based compensation expense was allocated to R&D expense in the amounts of $619,000 and $2.17 million respectively (2017 - $273,000 and $692,000) and corporate and administration expense in the amount of $887,000 and $3.47 million respectively (2017 - $795,000 and $2.59 million). The increase in stock-based compensation expense in 2018 compared to the same periods in 2017 was primarily due to an increase in the number of options granted in 2018 (primarily resulting from the increase in the number of employees from the comparable period in 2017 and the change in 2017 to a vesting period of 36 months from the 12 months used in 2016 for employees). Amortization of acquired intellectual property and other intangible assets was $403,000 and $1.20 million respectively for the three and nine month periods ended September 30, 2018 compared to $357,000 and $1.08 million recorded for the same periods in 2017, with no significant changes to acquired intellectual property and other intangible assets. We recorded other income of $563,000 and $1.33 million for the three month and nine month periods ended September 30, 2018 compared to other income of $315,000and $392,000 for the same periods in 2017. Interest income of $691,000 and $1.56 million for the three and nine months ended September 30, 2018 compared to $399,000 and $893,000 for the same periods in 2017. The increase in interest income reflected the significant increase in our cash position as a result of completing the March 20, 2017 Public Offering and an increase in interest rates in 2018. Revaluation expense adjustments on the contingent consideration to ILJIN SNT Co., Ltd. ("ILJIN") of $93,000 and $242,000 respectively for the three and nine months ended September 30, 2018 compared to $88,000 and $436,000 respectively for the same periods in 2017. The contingent consideration is more fully discussed in note 4 to the interim condensed consolidated financial statements for the third quarter ended September 30, 2018. Foreign exchange loss of $35,000 for the three months ended September 30, 2018 and a foreign exchange gain of $8,000 for the nine months ended September 30, 2018 compared to foreign exchange gain of $4,000 for the three months ended September 30, 2017 and a foreign exchange loss of $64,000 for the nine months ended September 30, 2017. In accordance with IFRS, a contract to issue a variable number of shares fails to meet the definition of equity and must instead be classified as a derivative liability and measured at fair value with changes in fair value recognized in the consolidated statements of operations and comprehensive loss at each period-end. To clarify, while we will settle these warrants only in shares in the future, accounting rules require that we show a liability due to the potential variability in the number of shares which may be issued if the cashless exercise option is used by the holder of the warrants under the specific situations discussed below. The derivative warrant liabilities will ultimately be eliminated on the exercise or forfeiture of the warrants and will not result in any cash outlay by Aurinia. for the issuance of the common shares underlying the Warrants to the holder, in lieu of exercising the Warrants for cash, a cashless exercise option to receive common shares equal to the fair value of the Warrants. This calculation is based on the number of Warrants to be exercised multiplied by the weighted average market price less the exercise price with the difference divided by the weighted average market price. If a Warrant holder exercises this option, there will be variability in the number of common shares issued per Warrant. There can be no certainty that we will have an effective registration statement in place over the entire life of the Warrants and therefore, under IFRS we are required to record these Warrants as derivative warrant liabilities. At September 30, 2018, there were 3.52 million Warrants outstanding. There was no change in the number of warrants outstanding for the three and nine month periods ended September 30, 2018. On February 14, 2014, we completed a $52 million private placement (the "Private Placement"). Under the terms of the Private Placement, we issued 18.92 million units at a subscription price per unit of $2.7485, each unit consisting of one common share and one-quarter (0.25) of a common share purchase warrant (the "2014 Warrants"), exercisable for a period of five years from the date of issuance at an exercise price of $3.2204. The holders of the 2014 Warrants issued pursuant to the Private Placement may elect, in lieu of exercising the 2014 Warrants for cash, a cashless exercise option to receive common shares equal to the fair value of the 2014 Warrants based on the number of 2014 Warrants to be exercised multiplied by a five-day weighted average market price less the exercise price with the difference divided by the weighted average market price. If a 2014 Warrant holder exercises this option, there will be variability in the number of common shares issued per Warrant. At September 30, 2018, there were 1.74 million Warrants outstanding related to this February 14, 2014 Private Placement. There was no change in the number of warrants outstanding for the three and nine month periods ended September 30, 2018. Derivative warrant liabilities are more fully discussed in the section “Critical Accounting Estimates and Judgments” and note 5 to the unaudited interim condensed consolidated financial statements for the three months ended September 30, 2018. At September 30, 2018, we had cash and short term investments on hand of $138.88 million compared to $150.20 million at June 30, 2018 and $173.46 million at December 31, 2017. We are in the development stage and are devoting substantially all of our operational efforts and financial resources towards the clinical development of our late stage drug, voclosporin, which includes the completion of the AURORA trial. For the nine months ended September 30, 2018, we reported a loss of $49.53 million and a cash outflow from operating activities of $38.00 million. As at September 30, 2018, we had an accumulated deficit of $401.37 million. We believe that our cash position is sufficient to fund our existing LN program including the AURORA clinical trial, conduct our current studies in FSGS and DES, complete the work required for NDA submission to the FDA, and fund operations into 2020. Our cash position provides funding to finish the AURORA clinical trial, which is expected to be completed in the fourth quarter of 2019. Estimated costs still to be incurred for AURORA are estimated to be approximately $35 million. AURORA 2, which commenced rolling over patients in the second quarter of 2018 is expected to have patients until the third quarter of 2021. The current estimate of the remaining clinical cost to be incurred for AURORA 2 is in the range of $16 million to $21 million. These remaining costs are expected to be incurred from October 1, 2018 to September 30, 2021. Net cash used in operating activities for the three and nine month periods ended September 30, 2018 was $11.33 million and $38 million respectively compared to cash used in operating activities of $8.53 million and $32.24 million respectively for the three and nine month periods ended September 30, 2017. Cash used in operating activities was composed of net loss, add-backs or adjustments not involving cash, such as stock-based compensation and change in estimated fair value of derivative warrant liabilities and net change in other operating assets and liabilities including prepaid expenses and deposits, and accounts payable and accrued liabilities. The comparable figures for nine months ended September 30, 2017 also included contingent consideration milestone payments of $2.15 million to ILJIN. Cash used in investing activities for the three months ended September 30, 2018 was $6.09 million compared to cash used in investing activities of $84.89 million for the three months ended September 30, 2017. Cash used in investing activities for the nine months ended September 30, 2018 was $16.14 million compared $94.96 million for the same period in 2017. The change in these amounts primarily related to movements within our short term investment portfolio which was comprised of bonds and treasury notes. Cash generated from financing activities for the three months ended September 30, 2018 was $8,000 compared to $1.24 million for the three months ended September 30, 2017. Cash generated from financing activities for the nine months ended September 30, 2018 was $3.40 million compared to $175.10 million for the nine months ended September 30, 2017. Cash generated from financing activities for the nine months ended September 30, 2018 was composed of $3.05 million from the exercise of warrants and $355,000 from the exercise of stock options. Cash generated from financing activities for the nine months ended September 30, 2017 was composed of net proceeds of $162.32 million from our March 20, 2017 financing, $8.92 million from the exercise of warrants and $3.86 million from the exercise of stock options. On December 28, 2016, we completed the December Offering for net proceeds of $26.14 million, the net proceeds of which are to be used to advance the clinical and non-clinical development of our lead drug, voclosporin, as a therapy for LN, and for working capital and corporate purposes. These proceeds were fully utilized by June 30, 2018. On March 20, 2017, we completed the March Offering for net proceeds of $162.32 million, which are to be used for R&D activities and for working capital and corporate purposes. A summary of the anticipated and actual use of net proceeds used to date from the above financings is set out in the table below. To September 30, 2018, there have been no material variances from how we disclosed we were going to use the proceeds from the above noted offerings and thus, there is no material impact on the ability to achieve our business objectives and milestones. Operating lease obligations are comprised of the future minimum lease payments for our premises. We have entered into contractual obligations for services and materials required for the AURORA clinical trial, drug supply, and other R&D activities. The purchase obligations presented represent the minimum amount to exit our contractual commitments. Contingent consideration to ILJIN is described in note 4 to the unaudited interim condensed consolidated financial statements for the three months ended September 30, 2018. As at September 30, 2018 we are party to agreements with CROs, central laboratories and other third party service providers providing services to us for the AURORA trial and other R&D activities. Corresponding anticipated expenses over the next twelve months are expected to be in the range of $30-35 million. Stephen P. Robertson, a partner at Borden Ladner Gervais ("BLG") acts as the Company’s corporate secretary. We incurred legal fees in the normal course of business to BLG of $16,000 and $108,000 respectively for the three and nine months ended September 30, 2018 compared to $41,000 and $195,000 respectively for the same periods in 2017. The amount charged by BLG is based on standard hourly billing rates for the individuals working on our account. We have no ongoing contractual or other commitments as a result of engaging Mr. Robertson to act as our corporate secretary. Mr. Robertson receives no additional compensation for acting as the corporate secretary beyond his standard hourly billing rate. The outstanding fair value of contingent consideration payable to ILJIN, an affiliated shareholder and related party, is the result of an Arrangement Agreement completed on September 20, 2013 between the Company, Aurinia Pharma Corp. and ILJIN. The contingent consideration payable to ILJIN is more fully discussed in note 4 of the unaudited interim condensed consolidated financial statements for the third quarter ended September 30, 2018. We have no material undisclosed off-balance sheet arrangements that have or are reasonably likely to have, a current or future effect on our results of operations or financial condition. The preparation of consolidated financial statements in accordance with IFRS often requires management to make estimates about, and apply assumptions or subjective judgment to, future events and other matters that affect the reported amounts of our assets, liabilities, revenues, expenses and related disclosures. Assumptions, estimates and judgments are based on historical experience, expectations, current trends and other factors that management believes to be relevant at the time at which our consolidated financial statements are prepared. Management reviews, on a regular basis, the Company's accounting policies, assumptions, estimates and judgments in order to ensure the consolidated financial statements are presented fairly and in accordance with IFRS. Critical accounting estimates and judgments are those that have a significant risk of causing material adjustment and are often applied to matters or outcomes that are inherently uncertain and subject to change. As such, management cautions that future events often vary from forecasts and expectations and that estimates routinely require adjustment. Management considers the following areas to be those where critical accounting policies affect the significant judgments and estimates used in the preparation of the Company’s consolidated financial statements. Contingent consideration is a financial liability recorded at fair value. The amount of contingent consideration to be paid is based on the occurrence of future events, such as the achievement of certain development, regulatory and sales milestones. Accordingly, the estimate of fair value contains uncertainties as it involves judgment about the likelihood and timing of achieving these milestones as well as the discount rate used. Changes in fair value of the contingent consideration obligation result from changes to the assumptions used to estimate the probability of success for each milestone, the anticipated timing of achieving the milestones and the discount period and rate to be applied. A change in any of these assumptions could produce a different fair value, which could have a material impact on the results from operations. The fair value estimates at September 30, 2018 were based on a discount rate of 10% (December 31, 2017 - 10%) and a presumed payment range between 50% and 74% (December 31, 2017 - 50% and 75%). The fair value of this contingent consideration as at September 30, 2018 was estimated to be $4.03 million (December 31, 2017 - $3.79 million) and was determined by estimating the probability and timing of achieving the milestones and applying the income approach. This is a Level 3 recurring fair value measurement. If the probability for success were to increase by a factor of 10% for each milestone, this would increase the net present value ("NPV") of the obligation by approximately $622,000 as at September 30, 2018. If the probability for success were to decrease by a factor of 10% for each milestone, this would decrease the NPV of the obligation by approximately $622,000 as at September 30, 2018. If the discount rate were to increase to 12%, this would decrease the NPV of the obligation by approximately $172,000. If the discount rate were to decrease to 8%, this would increase the NPV of the obligation by approximately $183,000. Warrants issued pursuant to equity offerings that are potentially exercisable in cash or on a cashless basis resulting in a variable number of common shares being issued are considered derivative liabilities and therefore measured at fair value. We use the Black-Scholes pricing model to estimate fair value at each exercise and period end date. The key assumptions used in the model are the expected future volatility in the price of our common shares and the expected life of the warrants. The key Level 3 inputs used by management to estimate the fair value are the market price and the expected volatility. If the market price were to increase by a factor of 10%, this would increase the estimated fair value of the obligation by approximately $3.30 million as at September 30, 2018. If the market price were to decrease by a factor of 10%, this would decrease the estimated fair value of the obligation by approximately $3.26 million. If the volatility were to increase by 10%, this would increase the estimated fair value of the obligation by approximately $360,000 as at September 30, 2018. If the volatility were to decrease by 10%, this would decrease estimated fair value of the obligation by approximately $340,000 as at September 30, 2018. Determining the fair value of stock options on the grant date, including performance based options, requires judgment related to the choice of a pricing model, the estimation of stock price volatility and the expected term of the underlying instruments. Any changes in the estimates or inputs utilized to determine fair value could result in a significant impact on our reported operating results, liabilities or other components of shareholders’ equity. The key assumption used by management is the stock price volatility. If the stock price volatility was higher by a factor of 10% on the option grant dates for the nine months ended September 30, 2018, this would have increased annual stock compensation expense by approximately $308,000. If the stock price volatility was lower by a factor of 10% on the grant date, this would have decreased annual stock compensation expense by approximately $264,000. We used the Black-Scholes option pricing model to estimate the fair value of the options granted for the nine months ended September 30, 2018 and 2017. We consider historical volatility of our common shares in estimating its future stock price volatility. The risk-free interest rate for the expected life of the options was based on the yield available on government benchmark bonds with an approximate equivalent remaining term at the time of the grant. The expected life is based upon the contractual term, taking into account expected employee exercise and expected post-vesting employment termination behavior. For the three months ended September 30, 2018, there were no changes to our critical judgments in applying the Company's accounting policies from those disclosed in our year ended December 31, 2017 audited consolidated financial statements. The information noted below discusses the impact of the adoption of IFRS 9 Financial Instruments, IFRS 15 Revenue from Contracts with Customers and IFRS 2 Share-based payment on our financial statements and discloses the new accounting policies that have been applied from January 1, 2018, where they are different to those applied in prior periods. The adoption of IFRS 9 Financial Instruments using the modified retrospective approach on January 1, 2018 (the date of initial application of IFRS 9) results in a change in accounting policy. In accordance with the transitional provisions in IFRS 9, comparative figures have not been restated. The reclassification of financial assets has therefore been recognized in the opening balance sheet on January 1, 2018. The new standard introduces expanded disclosure requirements and changes in presentation, these have minimally impacted the nature and extent of our disclosures. IFRS 9 is a three-part standard to replace IAS 39 Financial Instruments: Recognition and Measurement, addressing new requirements for (i) classification and measurement, (ii) impairment, and (iii) hedge accounting. On January 1, 2018, we have assessed which business models apply to the financial assets held by the Company and have classified our financial instruments into the appropriate IFRS 9 categories. There was no impact to the financial liabilities held by the Company. The investments held at December 31, 2017 were reclassified from available for sale to amortized cost. At January 1, 2018, the date of initial application, our business model is to hold investments for collection of contractual cash flows, and the cash flows represent solely payments of principal and interest on the principal amount. The fair value loss of $78,000 would have otherwise been recognized in other comprehensive income had the short term investments not been reclassified to amortized cost. The new impairment model requires the recognition of impairment provisions based on expected credit losses rather than only incurred credit losses as is the case under IAS 39. We have a nominal amount of accounts receivable, therefore, the change in impairment methodology due to the new standard does not have a significant impact on the financial statements. Our cash and cash equivalents and short term investments are also subject to the impairment requirements of IFRS 9, the identified impairment loss is not material. We had not entered into any hedges as at December 31, 2017 and have not undertaken hedging activities in the period ended September 30, 2018, therefore the hedge accounting section standard is not applicable to us at this time and does not have an impact on the financial statements. From January 1, 2018 we classify our financial assets as to be measured at amortized cost. The classification depends on our business model for managing the financial assets and the contractual terms of the cash flows. We will reclassify the investments when and only when our business model for managing those assets changes. At initial recognition, we measure a financial asset at its fair value plus, in the case of a financial asset not at fair value through profit or loss (FVPL), transaction costs that are directly attributable to the acquisition of the financial asset. Transaction costs of financial assets carried at FVPL are expensed in profit or loss. From January 1, 2018, we will assess on a forward-looking basis the expected credit losses associated with the Company's debt instruments carried at amortized cost and fair value through other comprehensive income (FVOCI). The impairment methodology applied depends on whether there has been a significant increase in credit risk. For receivables, we applied the simplified approach permitted by IFRS 9 which requires expected lifetime losses to be recognized from initial recognition of the receivables. The modified retrospective approach results in the cumulative effect, if any, of adoption being recognized at the date of initial application. We currently have no product sales or significant sources of revenue, therefore there is no effect upon initial application. We have agreements in specific regions with strategic partners. These agreements usually include one-time payments (upfront payments), payments for research and development services in the form of cost reimbursements, milestone payments and royalty receipts. Once we determine that a contract exists, and the contract is with a customer, it identifies the performance obligations within the contract. A performance obligation is a promise to provide a distinct good or service or a series of distinct goods or services and is the unit of account for recognizing revenue. Next we determine the transaction price. The transaction price reflects the amount of consideration to which we expect to be entitled in exchange for the goods or services transferred. Management takes into account consideration that is variable and only includes variable consideration to the extent that it is highly probable that a significant reversal in the amount of cumulative revenue recognized will not occur when the uncertainty associated with the variable consideration is subsequently resolved. License fees representing non-refundable payments received at the time of signature of license agreements are recognized as revenue upon signature of the license agreements when no significant future performance obligations and collectability of the fees is reasonably assured. These licenses provide a right to use our intellectual property. Upfront payments received at the beginning of licensing agreements when we have significant future performance obligations are deferred and recognized as revenue on a systematic basis over the period during which the related services are rendered and all obligations are performed. We recorded licensing revenue of $30,000 and $89,000 respectively for the three and nine month periods ended September 30, 2018 ($29,000 and $88,000 for the three and nine month periods ended September 30, 2017) related to the upfront license payment of $1.5 million received in 2010 pursuant to the 3SBio, Inc. ("3SBio") license agreement. Under the agreement, our primary substantive obligations are to grant the license and transfer intellectual knowledge to 3SBio. Under the agreement, we are also required to maintain the patent portfolio in China, Taiwan and Hong Kong, and to provide further support and cooperation to 3SBio over the life of the agreement, which coincides with the life of the patents. Any additional assistance which may be provided to 3SBio will be performed on a full cost recovery basis. The deferred licensing fee revenue is recognized on a straight-line basis as we satisfy the performance obligations over the life of the patents and the benefit to the customer transfers ratably throughout the patent life, which expires in 2022. As at September 30, 2018, $471,000 (December 31, 2017 - $560,000) of deferred revenue remains relating to this payment. We will provide commercial supply to 3SBio on a cost-plus basis and will receive ongoing royalties based on sales of voclosporin by 3SBio. On April 17, 2017, we entered into an agreement with Merck Animal Health ("MAH") whereby we granted them worldwide rights to develop and commercialize our patented nanomicellar VOS for the treatment of DES in dogs. Under the terms of the agreement, we received a technology access fee of $300,000. This agreement provided MAH with a right to use intellectual property. MAH was able to direct the use of and obtain substantially all of the benefits from the license at the time that control of the rights was transferred and therefore, the $300,000 technology access fee was recognized as revenue in fiscal 2017. We are eligible to receive further payments based on certain development and sales milestones and to receive royalties based on global product sales. We earned a contract milestone of $345,000 (CA$450,000) pursuant to a purchase and sale agreement dated February 14, 2014 with Ciclofilin Pharmaceuticals Corp. (now Contravir Pharmaceuticals, Inc.) under which we sold the Non-Immunosuppressive Cyclosporine Analogue Molecules ("NICAMs") early stage research and development asset to Ciclofilin. We recorded contract revenue and accounts receivable of $345,000 for the three months ended September 30, 2018 based on the milestone being achieved during the period. The receivable was collected in full in October of 2018. We are also eligible to receive further payments based on certain development and sales milestones and to receive royalties based on global product sales. We have no obligations under this agreement. We do not expect to receive any further milestone or royalty payments pursuant to this agreement in the foreseeable future. We do not consider the Ciclofilin agreement to be material to us or our operations. Milestone payments, which are generally based on developmental or regulatory events, are forms of variable consideration and are only included in the transaction price when it is highly probable that a significant reversal will not occur when the uncertainty associated with the milestone is subsequently resolved. Therefore, milestone payments that do not meet the highly probable criteria are recognized as revenue when the milestones are achieved, collectability is assured, and when we have no significant future performance obligations in connection with the milestones. In June 2016, the IASB issued final amendments to IFRS 2, clarifying how to account for certain types of share-based payment transactions. These amendments, which were developed through the IFRS Interpretations Committee, provide requirements on accounting for: (i) the effect of vesting and non-vesting conditions on the measurement of cash-settled share-based payments; (ii) share-based payment transactions with a net settlement feature for withholding tax obligations; and (iii) a modification to the terms and conditions of a share-based payment that changes the classifications of the transaction from cash-settled to equity-settled. We have evaluated the impact of these amendments and as a result have determined that there is no required change to our accounting policy related to share-based payments, and therefore no changes to the consolidated financial statements are required. The following standard is effective for annual periods beginning on or after January 1, 2019. In January 2016, the IASB issued IFRS 16 Leases, which will replace IAS 17 Leases. Under IFRS 16, a contract is, or contains, a lease if the contract conveys the right to control the use of an identified asset for a period of time in exchange for consideration. Under IAS 17, lessees were required to make a distinction between a finance lease and an operating lease. IFRS 16 now requires lessees to recognize a lease liability reflecting future lease payments and a right-of-use asset for virtually all lease contracts. There is an optional exemption for certain short-term leases and leases of low-value assets; however, this exemption can only be applied by lessees. The standard is effective for annual periods beginning on or after January 1, 2019, with earlier adoption if IFRS 15 is also applied. We have elected to adopt IFRS 16 effective January 1, 2019. To date we have identified two facility leases that will be impacted by the new standard and are assessing the potential financial impact that the adoption of IFRS 16 will have on our consolidated financial statements with regards to these facility leases.We are also currently reviewing our non-facility related agreements to determine whether any of these agreements will be impacted by IFRS 16. We have invested a significant portion of our time and financial resources in the development of voclosporin. We anticipate that our ability to generate revenues and meet expectations will depend primarily on the successful development, regulatory approval and commercialization of voclosporin. our ability to raise future financial resources when required. Future additional sources of capital could include payments from equity financings, debt financings, potential new licensing partners, and/or the monetization of our intangible assets. A more detailed list of the risks and uncertainties affecting us can be found in our AIF which is filed on SEDAR and EDGAR. Our objective in managing capital, consisting of shareholders' equity, with cash, cash equivalents and short term investments being its primary components, is to ensure sufficient liquidity to fund R&D activities, corporate, administration and business development expenses and working capital requirements. This objective has remained the same from that of the previous year. Over the past two years, we have raised capital via public and private equity offerings and drawdowns under two at-the-market facilities as our primary sources of liquidity. As our policy is to retain cash to keep funds available to finance the activities required to advance our product development, we do not currently pay dividends. We are not subject to any capital requirements imposed by any regulators or by any other external source. We are exposed to credit risks and market risks related to changes in interest rates and foreign currency exchange, each of which could affect the value of our current assets and liabilities. We invest our cash reserves in U.S. dollar denominated, fixed rate, highly liquid and highly rated financial instruments such as treasury notes, banker acceptances, bank bonds, and term deposits. We do not believe that the results of operations or cash flows would be affected to any significant degree by a sudden change in market interest rates relative to our investment portfolio, as the majority of our funds were held in cash or cash equivalents ($114.90 million at September 30, 2018) or liquid interest bearing short term investments ($23.99 million at September 30, 2018). Our activities can expose us to a variety of financial risks: market risk (including currency risk, interest rate risk and other price risk), credit risk and liquidity risk. Risk management is carried out by management under policies approved by the Board. Management identifies and evaluates the financial risks. Our overall risk management program seeks to minimize adverse effects on our financial performance. Liquidity risk is the risk we will not be able to meet our financial obligations as they fall due. We manage our liquidity risk through the management of our capital structure and financial leverage, as discussed above in "Capital management". We also manage liquidity risk by continuously monitoring actual and projected cash flows. The Board reviews and approves our budget, as well as any material transactions out of the ordinary course of business. We invest our cash equivalents in U.S. denominated term deposits with 30 to 90-day maturities, and/or U.S. denominated short term investments consisting of bonds and treasury notes issued by banks and/or United States or Canadian governments with maturities not exceeding two years to ensure our liquidity needs are met. All of our financial liabilities are due within one year except for the contingent consideration, as described in note 4 to the unaudited interim condensed consolidated financial statements for the third quarter ended September 30, 2018 and the derivative warrant liabilities, as described in note 5 to the unaudited interim condensed consolidated financial statements for the third quarter ended September 30, 2018. Interest rate risk is the risk the fair value or future cash flows of a financial instrument will fluctuate because of changes in market interest rates. Financial assets and financial liabilities with variable interest rates expose us to cash flow interest rate risk. Our cash and cash equivalents are comprised of highly liquid investments that earn interest at market rates and the short term investments are comprised of bank or government bonds with a maturity of two years or less. Accounts receivable, accounts payable and accrued liabilities bear no interest. We manage our interest rate risk by maintaining the liquidity necessary to conduct operations on a day-to-day basis. Our exposure to interest rate risk as at September 30, 2018 was considered minimal as the majority of our financial resources were held as cash and cash equivalents. Financial instruments that potentially subject us to significant concentrations of credit risk consist principally of cash, cash equivalents and short term investments which were held at three major Canadian banks. We regularly monitor the credit risk exposure and take steps to mitigate the likelihood of these exposures resulting in actual loss. We are exposed to financial risk related to the fluctuation of foreign currency exchange rates. Foreign currency risk is the risk that variations in exchange rates between the U.S. dollars and foreign currencies, primarily with the Canadian dollar, could affect our operating and financial results. The Company holds its cash reserves in U.S. dollars and the majority of its expenses, including clinical trial costs, are also denominated in U.S. dollars, which mitigates the risk of foreign exchange fluctuation. At September 30, 2018, we had a net exposure of $819,000 to the Canadian dollar compared to a net exposure of $273,000 at September 30, 2017. Patents and other proprietary rights are essential to our business. Our policy has been to file patent applications to protect technology, inventions, and improvements to our inventions that are considered important to the development of our business. We are pursuing certain avenues to expand the voclosporin intellectual property portfolio, including a use patent strategy (which involves potential development of use patents driven by AURA Phase IIb data) and a potential manufacturing patent and trade secret strategy. The Company has an extensive granted patent portfolio related to cyclosporine analogs, including granted United States patents, covering voclosporin composition of matter, methods of use, formulations and synthesis. The corresponding Canadian, South African and Israeli patents are owned by Paladin Labs Inc. We anticipate that upon regulatory approval, patent protection for voclosporin will be extended in the United States (Patent Term Extension) and certain other major markets, including Europe and Japan, until at least October 2027 under the Hatch-Waxman Act in the United States and comparable patent extension laws in other countries (including the Supplementary Protection Certificate program in Europe). Opportunities may also be available to add an additional six months of exclusivity related to pediatric studies which are currently in the planning process. In addition to patent rights, we also expect to receive "new chemical entity" exclusivity for voclosporin in certain countries, which provides from five years in the United States and up to ten years in Europe. We have licensed the development and distribution rights to voclosporin for China, Hong Kong and Taiwan to 3SBio. This license is royalty bearing and we will also supply finished product to 3SBio on a cost-plus basis. We do not expect to receive any royalty revenue pursuant to this license in the foreseeable future. We have patent protection for VOS as we own two granted United States patents and 13 patents in other jurisdictions related to ophthalmic formulations of calcineurin inhibitors or mTOR inhibitors, including voclosporin. We also have one granted United States patent and 10 patents in other jurisdictions related to topical drug delivery system for ophthalmic use. These patents expire between 2028 and 2031. We may, from time to time, be subject to claims and legal proceedings brought against us in the normal course of business. Such matters are subject to many uncertainties. Management believes that the ultimate resolution of such contingencies will not have a material adverse effect on our consolidated financial position. We have entered into indemnification agreements with our officers and directors. The maximum potential amount of future payments required under these indemnification agreements is unlimited. However, we do maintain director and officer ("D&O") insurance to limit our exposure. We have entered into an agreement dated February 14, 2014 whereby we are required to pay a third party a royalty equivalent to 2% of royalties received on the sale of voclosporin by licensees and/or 0.3% of net sales of voclosporin sold directly by the Company. Should we sell substantially all of the assets of voclosporin to a third party or transfer those assets to another party in a merger in a manner such that this payment obligation is no longer operative, then we would be required to pay 0.3% of the value attributable to voclosporin in the transaction. We have entered into license and research and development agreements with third parties that include indemnification and obligation provisions that are customary in the industry. These guarantees generally require us to compensate the other party for certain damages and costs incurred as a result of third party claims or damages arising from these transactions. These provisions may survive termination of the underlying agreement. The nature of the obligations prevents us from making a reasonable estimate of the maximum potential amount we could be required to pay. Historically, we have not made any payments under such agreements and no amount has been accrued in the accompanying unaudited interim condensed consolidated financial statements. For the third quarter ended September 30, 2018, there were no changes to our disclosure controls or to our internal controls over financial reporting that materially affected, or are reasonably likely to materially affect, such controls. Subsequent to September 30, 2018 we issued 20,000 common shares upon the exercise of 20,000 stock options for proceeds of $53,000. We also issued 25,000 stock options at an exercise price of $5.93 (CA$7.70). The primary factors affecting the magnitude of our losses in the various quarters are noted below and include the timing of R&D costs associated with the clinical development program, timing and amount of stock compensation expense, and fluctuations in the non-cash change in estimated fair value of derivative warrant liabilities. The increase in R&D costs for the three months ended September 30, 2018 and June 30, 2018 was due to the ramp up in AURORA trial costs, and startup costs for AURORA 2 and the Phase II FSGS and DES trials. The increase in R&D costs for the three months ended March 31, 2018, December 31, 2017 and September 30, 2017 primarily reflect expenses associated with our AURORA trial, including CRO and drug supply expenses. Corporate, administration and business development costs included non-cash stock-based compensation expense of $887,000 for the three months ended September 30, 2018, $1.26 million for the three months ended June 30, 2018, $1.33 million for the three months ended March 31, 2018, $656,000 for the three months ended December 31, 2017, $795,000 for the three months ended September 30, 2017, $718,000 for the three months ended June 30, 2017, and $1.08 million for the three months ended March 31, 2017. The three months ended March 31, 2017 also included a provision amount of $519,000 related to the departure of the former Chief Executive Officer (Charles Rowland) on February 6, 2017. We record non-cash adjustments each quarter resulting from the fair value revaluation of the derivative warrant liabilities. These revaluations fluctuate based primarily on the market price of our common shares. An increase in the market price of our common shares results in a loss on revaluation while a decrease results in a gain on revaluation. The change in the estimated fair value of the derivative warrant liabilities for the three months ended September 30, 2018 of $4.80 million primarily reflected an increase in our share price to $6.64 per share at September 30, 2018 compared to $5.63 per share at June 30, 2018. The change in the estimated fair value of the derivative warrant liabilities for the three months ended June 30, 2018 of $1.93 million primarily reflected an increase in our share price to $5.63 per share at June 30, 2018 compared to $5.19 per share at March 31, 2018. The change in the estimated fair value of the derivative warrant liabilities for the three months ended March 31, 2018 of $2.63 million primarily reflected an increase in our share price to $5.19 per share at March 31, 2018 compared to $4.53 per share at December 31, 2017. The change in the estimated fair value of the derivative warrant liabilities for the three months ended December 31, 2017 of $9.01 million primarily reflected a decrease in our share price to $4.53 per common share at December 31, 2017 compared to $6.27 per share at September 30, 2017. The change in the estimated fair value of the derivative warrant liabilities for the three months ended June 30, 2017 of $7.50 million primarily reflected a decrease in our share price to $6.13 per common share at June 30, 2017 compared to $7.34 per common share at March 31, 2017. The change in the estimated fair value of derivative warrant liabilities of $40.78 million for the three months ended March 31, 2017 reflected the significant increase in our share price from $2.10 per common share at December 31, 2016 to $7.34 per common share at March 31, 2017.